Barefoot Artists brings the transformative power of art to the most impoverished communities in the world through participatory and multifaceted projects that foster community empowerment, improve the physical environment, promote economic development, and preserve and support indigenous art and culture. Barefoot Artists develops projects in collaboration with individuals and agencies on the ground in identified communities. Art in this context becomes a vehicle for amplifying and coordinating existing efforts through projects that inspire individuals and physically transform communities. The collective process used in these projects fosters a sense community pride while allowing participants to experience a sense of individual accomplishment. 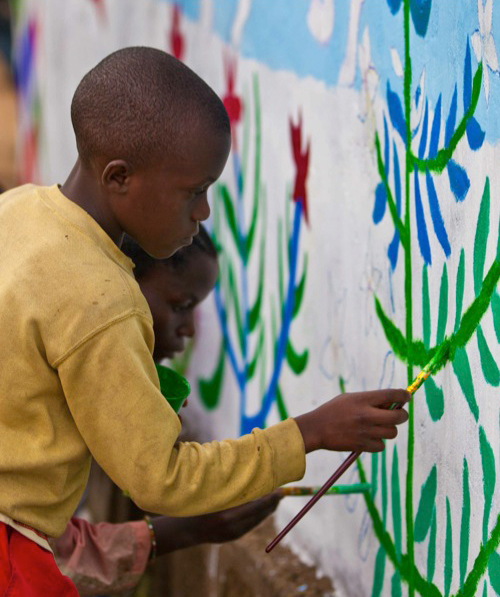 While Barefoot Artists draws inspiration from world art and culture, each project is tailored to the unique needs and characteristics of that community. When possible, Barefoot Artists incorporates local artists and craftspeople into our projects. Moreover, Barefoot Artists aims to develop markets for locally produced and fairly traded crafts. Barefoot Artists recognizes the power of art, image making and narrative stories to move and educate people. Therefore each Barefoot Artists project is carefully documented and distributed as broadly as possible through the Internet, print publications, speaking engagements, and video.